THE name of the Great Republic, the biggest sailing ship of her time, is always linked with that of Donald McKay in a way that absolves him from blame for her comparative failure and pays tribute to his courage in building such a ship. 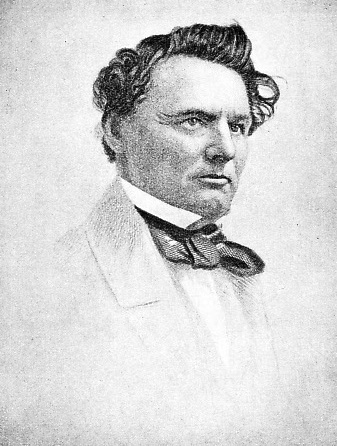 DONALD McKAY, ONE OF THE GREATEST BUILDERS OF CLIPPER SHIPS. It was his ambition to build the biggest clipper ship that the world had ever seen, and it is no reflection on his skill that the Great Republic was a comparative failure. Despite McKay’s fine reputation and long succession of first-class ships, the old-timers shook their heads and foretold disaster when they heard of his plans to build the Great Republic. His reasons for doing so were threefold. First there was the desire for greater carrying economy which a bigger vessel would give, for seamen were becoming increasingly expensive and the more cargo that could be carried in one bottom, the less the cost per ton. Secondly there was his personal pride, of which he made no secret. He was in the front rank of clippership designers and builders, although in his lifetime he did not stand alone as his memory does to-day, and it was natural for a man whose life was devoted to the ships that he built to desire to construct one which was beyond the power of his competitors. He was far too big a man to make any secret of this and far too good a patriot to minimize the third of his reasons, which was to prove to the world that American builders of wooden ships could turn out tonnage of a size and quality far beyond anything which had yet been considered. Across the Atlantic British builders were beginning to show wonderful results from iron hulls, and unless they were checked by worthy competition the American industry, even with its advantage of unlimited natural material, would be ruined. When he designed the Great Republic McKay had British trade in mind for her to cover, as she was entitled to do since the repeal of the Navigation Act in 1849. Gold had been discovered in Australia and the long voyage out with emigrants reproduced to an extent the difficulties of the American inter-coastal trade to California, with many others added. That trade would give his idea of a giant ship its best chance of success, and it would put what he intended to be his masterpiece before the British shipping world. She would be able to carry a large number of passengers in unprecedented comfort, with a sufficient quantity of water - always the main anxiety in an emigrant ship - and paying cargo. She had to do this in the face of fierce open competition. Every consideration demanded size, and McKay had sufficient faith in his designs and sufficient skill to secure the necessary strength to build a ship of a size considered impossible. Despite his reputation and long succession of first-class ships, the old-timers shook their heads and foretold disaster. The Great Republic was designed for a registered tonnage of 4,555 on a length of 335 feet, a beam of 53 feet, and a depth of 38 feet. She had four decks, the uppermost (spar) deck being flush with the covering board in a manner later made familiar with steamers, but novel then with sailing vessels. Her hull was built with immense strength, obviously necessary if such a length were to be driven through heavy seas with only a wooden backbone, and a good deal of iron latticework was embodied in it. To reduce the number of men as much as possible the most economical rig had to be given her and that of a four-masted barque was chosen. For the same purpose McKay fitted the double topsails as invented by Captain R. B. Forbes in 1841. The Great Republic was the first big ship in which Forbes’ attempt to make the sails area more manageable was tried. She had 15,653 running yards of canvas and to permit it to be handled, as well as to work the bilge pumps, a 15-hp steam engine was placed on deck. building a ship of such dimensions, were horrified when she was christened with a bottle of Cochituate water instead of cham-pagne. This water had recently been brought into Boston for drinking purposes and the growing temperance party in New England was making the most of its virtues. After the launch McKay did what he could to give the women of this temperance party the pleasing impression that he was specially considering their feelings; but some young apprentices had, in fact, got hold of the champagne the night before the launch and drunk it in the mould loft. 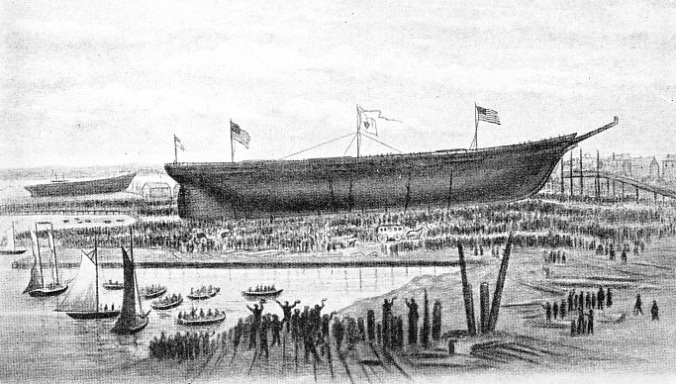 LAUNCH OF THE GREAT REPUBLIC at Donald McKay’s shipyard, Boston, USA, on October 4, 1853. It had been McKay’s ambition to have the ship launched on his forty-third birthday, but this proved to be impossible, and she was launched a month later, before more than 50,000 spectators. The superstitious, who had already expressed their doubts about a ship of such dimensions, were horrified when she was christened with a bottle of Cochituate water instead of the conventional champagne. This was not done to appease the feelings of temperance people, but was necessary because some apprentices drank the champagne the night before the launch. The Great Republic took the water as McKay’s own property and was built without a cent having been borrowed on bottomry (eg. a system of lending money to shipowner for purposes of voyage on security of ship, lender losing the money if the ship is lost.) He had no intention of being a shipowner, but when none of his clients would consider such a big ship he determined to run her himself on the Australian trade. His brother, Captain Lauchlan McKay, who had made a high reputation as master of the Sovereign of the Seas, was put in command and became as enthusiastic as her owner. The tug R. B. Forbes, named after the ingenious captain who had invented her double topsails, was sent round to Boston to tow her to New York. Captain Forbes persuaded McKay to take advantage of the interest that she created to make a small charge for the privilege of inspecting her, the sum to go to establishing the projected “Snug Harbour” for aged seamen in Boston. The idea was a great success; thousands flocked to see the wonder ship as part of their Christmas entertainment in New York, and the “Snug Harbour” received enough money to start operations. But that was an end to the luck of the great vessel. She was lying alongside the quay and had almost completed her loading with a general cargo, mostly provisions for Liverpool, preparatory to carrying emigrants out to Australia, when a spark from a fire ashore set light to her rigging and in a short time she was a blazing mass aloft. The fire engines of that day were powerless to throw their jets to the top of her lofty masts, and as the burning spars fell they set light to her deck fittings. Two clipper ships in adjoining berths, the Joseph Walker and the White Squall, were destroyed; the Great Republic lay scuttled at the bottom of the dock, burned down to the water’s edge. As much as £60,000 had been spent in building her and fitting her out; her hull was insured for £36,000, and with freight, McKay received about £47,000 from the underwriters. The financial loss crippled him for some years; the destruction of all his high hopes broke his heart and, although he did some of his best work afterwards, affected him to the end. McKay abandoned the wreck to the underwriters, who sold what remained. Her cargo was completely spoiled by fire and water, and the raising of such a big hull was by no means an easy matter. A temporary stern was rigged and the hull was frapped in canvas, after which four portable steam pumps cleared the water and brought her to the surface. Captain N. B. Palmer, one of the best-known American clipper ship masters, bought the wreck on behalf of A. A. Low & Co, and it was largely his ingenuity which resulted in her salvage. She was taken round to Sneeden & Whitlock’s yard at Green-point, Long Island, and rebuilt under his supervision. Like most sailing-ship men of the time, he had been doubtful how she would pay with her original immense size, and on his advice the reconstruction was on a smaller scale. By not replacing her spar deck, her registered tonnage was reduced to 3,357 and her cargo capacity by nearly 2,000 tons, while she was also drastically cut down aloft. Howe’s double topsails replaced those of Forbes’ patent, the 120-ft main yard and the 110-ft fore yard were cut down by twenty feet each, the masts were shorter and the whole sail plan was reduced. The original crew was to have been a hundred men and thirty ordinary seamen and boys, but as she reappeared she demanded fifty able seamen with twelve or fifteen ordinary seamen and boys. THE GREAT REPUBLIC WAS DESIGNED to have a registered tonnage of 4,555 on a length of 335 feet, a beam of 53 feet, and a depth of 38 feet. She had four decks, the uppermost (spar) deck being flush with the covering board in a manner later common with steamers, but novel in those days with sailing ships. Under the command of Captain Limeburner she loaded a second cargo in New York, and finally sailed in February, 1855, consigned to W. S. Lindsey & Co, whose principal, the historian of the British Merchant Service, recorded that she was much too big to be profitably employed in ordinary trade. She made the run to Liverpool in nineteen days, behaving as a tall ship should, although she was drawing twenty-five feet of water and had to lighter a large part of her cargo before she could get alongside. The Crimean War, which was then being fought settled the question of her remunerative employment, the French Government immediately chartering her as a transport and munition ship because of the large carrying capacity. Her first passage was from Liverpool to Marseilles with 1,600 British troops for transhipment into four steamers, to continue the voyage to the Black Sea. The charter rate was 17s. a ton a month, and she remained on this profitable business until the end of the war, when she returned to New York to prepare for an intercoastal cargo. She sailed from New York in December, 1856, broke the record by crossing the Line in fifteen days eighteen hours from Sandy Hook, and finally, in spite of being delayed for five days by calm and fog off the Californian coast, made San Francisco ninety-two days out, one day’s run being 413 miles. Had it not been for her bad luck at the end of the voyage, it is more than probable that she would have lowered the inter-coastal record; as it was her supporters pocketed a large sum in bets from those who backed the Westward Ho! from Boston. 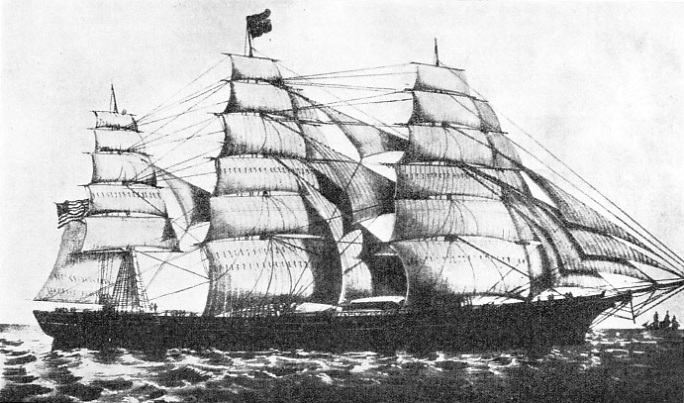 Being far too large for the China trade, on which many of the inter-coastal clippers were put after they had finished the westward run, she picked up a cargo of guano in the Chincha Islands for London and, being damaged, had to put into the Falkland Islands, where she remained six months for repairs. The carpenters in the islands were well accustomed to big jobs on sailing ships, but they had never tackled anything the size of the Great Republic, and most of the materials had to be specially brought from the mainland. Her provisions, which had to be replaced when the sea water, strongly impregnated with guano, leaked through into the lazarette, were also more than the islanders could provide and had to be brought from the River Plate. It was not until early in 1858 that she reached London, where she again had to transfer part of her cargo into lighters before she could pass over the sill of Victoria Dock. Back in the United States, she was again put on berth to San Francisco. The West was growing up and demanded from the Eastern States a large number of commodities which were difficult, or impossible, to carry by ordinary ship. The size of the Great Republic enabled her to take bulky freight under deck, and she had a reputation for good delivery of cargo; these factors, with her smart outward passages, and with Captain Limeburner’s name, secured her excellent bookings among the gold seekers. Her passages varied, but were generally in the neighbourhood of 105 to 120 days; homeward she generally sailed in ballast owing to the difficulty of filling her with cargo on the West Coast, but occasionally she ran from San Francisco to Liverpool with grain. She never attempted to beat her fine maiden passage, but her runs were generally creditable. As in most sailing ships in those days, she was owned in shares, and A. A. Low & Brother & Co. had sold a considerable number, amounting to forty sixty-fourths, to interests in Virginia and South Carolina, so that when she arrived at New York in the early days of the American Civil War she was seized as being principally the property of rebels, although it was soon arranged that Low & Brother should take over the Southern interest. The United States Government then chartered her for transport and munition purposes for the Port Royal expedition, but the troops on board mutinied off their destination and caused considerable trouble. In February, 1862, she was again taken up by the Government for General Butler’s expedition to Ship Island, curiously enough being towed part of the way down by the tug R. B. Forbes, which had taken charge of her after her launch. Off the island, during a gale, she collided with the transport Idaho - she had been bunkering Federal men-of-war when the gale started - and both ships drove on to the mud banks. She was, however, salved with very little difficulty, although she was ashore again a few days later and was eventually returned to her owners as being too big for transport work. About that time her jigger was removed and she became a three-masted ship. Between 1862 and 1865 she was back again on the inter-coastal trade to San Francisco. Some of her voyages were exciting, because at that time the American Navy was demanding all the best men, and merchant ships sailing from New York had to be content with what they could get. Shortly before her last round voyage Captain Limeburner, who had been in command since her reconstruction, retired and was succeeded by Captain Josiah Paul, who did the best that he could with the poor crew at his disposal. THE HULL OF THE GREAT REPUBLIC WAS OF IMMENSE STRENGTH, This was necessary if such a length of ship were to be driven through heavy seas with only a wooden backbone, and a good deal of iron lattice work was embodied in the hull. To reduce the number of men as much as possible, the most economical rig had to be given her, and that of a four-masted barque was chosen. For the same purpose McKay fitted the double topsails invented by Captain R. B. Forbes. The Great Republic had 15,653 running yards of canvas, and to permit it to be handled, as well as to work the bilge pumps, a 15-hp steam engine was placed on deck. When Paul returned to New York in 1865, the vessel was laid up for nearly two years, having failed to find an active buyer, although her owners took the greatest care with her fabric and she was visited by thousands of sightseers. 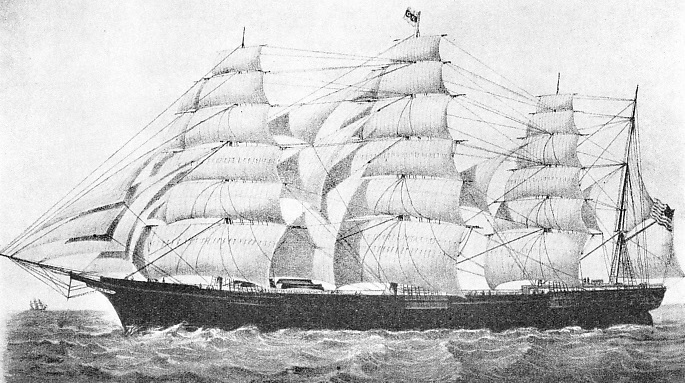 In 1866 an enterprising master mariner from Yarmouth, Nova Scotia, Captain J. S. Hatfield, bought her, but was unable to complete, and she was still under Low’s ownership when she was recommissioned in 1868 and did the passage from St. John to Liverpool in fourteen days, one of the fastest passages on record and one that seemed to justify the saying that no steamer could catch her when she had a whole-sail leading wind. In January, 1869, she was sold to the Merchants Trading Company, of Liverpool, for £3,500, and hoisted the British flag as the Denmark. The company employed her tramping, carrying various cargoes to such ports as could accomm-odate a ship of her draught, but principally on the East India trade, where the big sailing ship still had an advantage owing to the coaling difficulties of the steamer. In this undignified role she sailed. from Rio in ballast in January, 1872, ordered to St. John, New Brunswick, to load a cargo of lumber, the sailing ship’s last hope, for the United Kingdom. For a long time past she had been giving a good deal of trouble; her huge hull had strained badly, having been driven on the Californian trade, and she had been fitted with two unusually large double-acting pumps. When, on March 2, 1872, she was caught in a strong gale from the north-west near the Bermudas, a leak, which had been patched on her previous voyage, became very much worse and for three days the water gained steadily on the pumps. Then the wind took off, but as there were twelve feet of water in the hold and no chance of getting to the leak, the master decided to abandon her, and all hands reached Bermuda safely in the boats. As the ship was still afloat when her crew left her, there was talk of her being salvable, and it was even planned to fit out an expedition to search for her, but she was never seen again and probably foundered.